We are here to help, and answer your questions about dental care, including smile makeovers, cold sores and fever blisters, dental cleanings, dentures, and dental implants. What can I expect when I come to the office for a dental cleaning? During your first visit you will experience the most comprehensive, thorough dental evaluation you’ve ever had. Learn more about preventive care. Does your office provide dental care for children? If so, at what age do children need to visit the dentist? Yes. We provide dental care for many families with children of all ages! Our team works great with kids which is crucial to setting the stage at a young age that dental care is important and not scary. It is recommended that a child’s first visit for dental care should be between ages 2 to 5 years. However, if an area of concern is seen or felt by you or your child, children under age 2 are always welcome! I have a fear of dentists…How can you help me? Your comfort is always our #1 concern! We understand how you feel. Many of our patients have felt the same way about dental care after having suffered through bad or negative experiences as a child or even as adults. Our patient’s have found that once they have come to know our comforting dental team and have experienced the warm, calming environment that our office is known for many of their fears have been alleviated. If you still are apprehensive about dental care, we offer multiple options to make your visits more comfortable. We have nitrous oxide (laughing gas) available for all visits. In addition, we can also prescribe medication for you to take prior to your visit to help you to relax. Even patients who were once extremely fearful of dentists have often fallen asleep during their treatment! Dr. Pawl says this is THE BEST compliment a dentist can receive! Call us today for a consultation at 619-466-4544 or send us a quick email! Do you offer treatment for cold sores? Yes we do! Relief is just a phone call away! Learn more about Cold Sore / Canker Sore Treatment. What options do you have available for lightening my teeth? Stains on or beneath the tooth enamel can be frustrating and can affect the brightness of your smile. Stains can be caused by aging, tooth defects, smoking or diet. We offer both in-office and at-home treatments to best fit your needs. 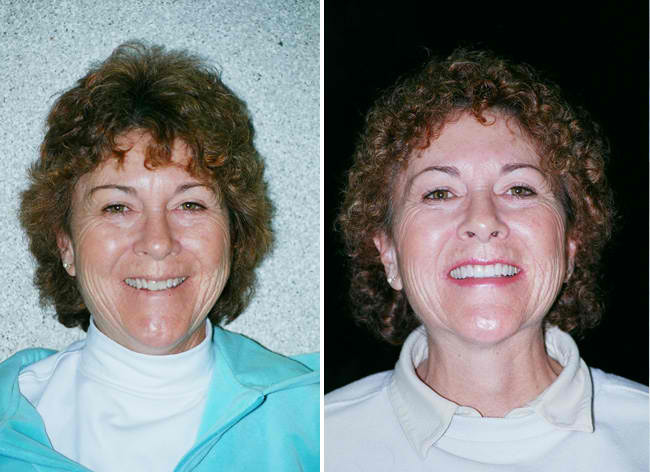 In addition to teeth lightening treatments, our office also offers multiple options, both permanent and removable, to not only lighten your teeth, but enhance the overall look of your smile! For more information on the options available for you, please schedule a complimentary consultation with our office today. Do you work with dental implants? Yes, we work with all types of implants! Please click here for more information. Learn more aboutImplant Restoration. How can you help me make my dental treatment affordable and to work into my budget? Our office is here to help make your dental needs and desires into a reality. We offer three programs which feature no-interest plans for up to 24 months. Every situation is different so please call us for more specific information based on your needs. Learn more aboutpayment options. Dr. Pawl is the most FANTASTIC dentist I’ve seen! I came to him through a friend. That was in 2005. Then in the beginning of 2006 he made my teeth straight and beautiful. I now smile with confidence and ease! What more can I say but Dr. Pawl and his extended family really take care of you! I heard about your office from a friend who said my exam and x-rays are complimentary as a new patient…is this true?